The IAAF will on Monday learn the findings of an independent report into claims of doping, cover-ups, and extortion in Russian athletics. An independent commission, set up by the World Anti-Doping Agency (Wada), will publish its findings at 14:00 GMT. The report will show "a different scale of corruption", even compared with Fifa, said co-author Richard McLaren. Lord Coe, president of athletics' governing body, the IAAF, has admitted these are "dark days for the sport". In an interview with BBC Radio 5 live's Sportsweek, Coe added: "The day after I got elected, I started a massive review. Understandably, in the light of the allegations that have been made, that review has been accelerated. Lawyer McLaren, told BBC World Service that the independent commission was given a "very narrow mandate" to "determine the accuracy" of allegations made in a German TV documentary about Russian athletics last December. It claimed that Russian officials systematically accepted payment from athletes to supply banned substances and cover up tests, while the IAAF was implicated in covering up the abuse. Wada president Sir Craig Reedie, also on Sportsweek, said of Monday's report: "I think it will be very robust in terms of what it was set up to do, which was to examine serious breaches of doping rules in Russia, and the anti-doping community and sport should be ready for that." 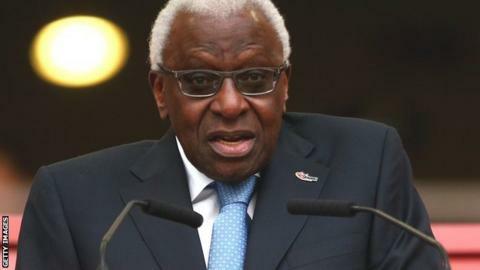 Lamine Diack, 82, the ex-president of the IAAF, is under investigation on suspicion of corruption and money laundering. Briton Coe was vice-president of the organisation for eight of the 16 years that Diack was in charge. However, he said he was not aware of any of the allegations made against the Senegalese, who stepped down in August, until they "first surfaced at the start of the week". He added: "That was the first that I had heard of them and that is almost certainly the case for everyone in the sport." At the time of his election, double Olympic 1500m champion Coe had described Diack as the IAAF's "spiritual" leader but accepted on Sunday that he was "going to come in for criticism for those remarks". However, he said: "It does presume I had a list of allegations in front of me at that moment, and I didn't." After several days of silence, Coe's fightback on behalf of the sport he was elected to lead just three months ago has begun not a moment too soon. He has been criticised for previously calling media investigations into allegations of doping a "declaration of war", and for referring to the man he replaced, Lamine Diack as the sport's "spiritual" leader. He has also refused to end his ambassadorial role with Nike, despite claims this amounts to a conflict of interest. Coe knows he must now be seen to live up to the pledge he made during his presidential election campaign and somehow rebuild trust in athletics after a year of horribly damaging headlines. But with Wada preparing to reveal the results of its long investigation into athletics on Monday, the former middle-distance champion knows things are about to get even worse before they can get better. When asked if countries which persistently produce athletes who dope should be thrown out of the sport, Coe said: "I have never said never but my instinct is engagement rather than isolation. "We need a generation of coaches and athletes to believe that it is possible to reach the pinnacle of sport with integrity and as clean athletes. "We will continue to lead the fight against drugs in sport on behalf of clean athletes - those who cheat will be caught and those who are caught will be thoroughly investigated and the guilty will face the fullest sanctions available. "We have to make sure clean athletes know that we are in their corner and I will do everything I possibly can to make sure we rebuild trust in this sport. "My task is to build a sport that will be accountable, responsible and responsive, but it will take time." Will athletics ever be clean? "No," was Coe's straightforward answer. "The practicality is there will always be a few people who try to step beyond the moral boundaries. "It is our responsibility to make sure the right systems are in place and the right people to uphold these systems." He also reiterated he would "absolutely" like to see athletes found guilty of doping receive life bans but added that despite "legal brains addressing the subject time and time again, we have failed to win that argument". Diack's son, Papa Massata Diack, is among four men charged by the body over ethics code breaches. Papa Diack is a former consultant to the IAAF. The other three are: the former head of the IAAF anti-doping department Gabriel Dolle, the former president of the All-Russia Athletic Federation (ARAF) Valentin Balakhnichev and Alexei Melnikov, a former chief ARAF coach for long distance walkers and runners. "That people in our sport have allegedly extorted money from athletes guilty of doping violations is abhorrent," Coe said in an earlier statement sent to Reuters and Britain's Sunday Times newspaper. When the Sunday Times broke a second story on allegations of widespread doping in athletics in August, Coe described it as a "declaration of war" - a remark which he has been called to explain to a Parliament select committee later this month. The 59-year-old also said it was time to "come out fighting" to protect the sport's reputation and added: "There is nothing in our history of competence and integrity in drug testing that warrants this kind of attack." Despite his election, Coe still remains as an ambassador for sportswear company Nike and has said he does not believe there is a conflict of interest between the two roles. He also publicly backed Alberto Salazar - coach of Britain's Olympic champion Mo Farah - who is also head of the Nike Oregon Project and remains the subject of a United States Anti-Doping Agency investigation. BBC Radio 5 live has a special track and field programme on Monday from 21:00-22:30 GMT.